Flight attendants are up in arms after deputy prime minister’s daughter Nurulhidayah Ahmad Zahid criticised Malaysia Airlines Bhd for having “old” flight attendants. Nurulhidayah said this in a posting on her Instagram account, but has since removed it. “It is unbecoming and has angered many Malaysia Airlines cabin crew members. As the DPM’s daughter, she must be more courteous in her comments on the social media. “She should show sensitivity and watch her behaviour, especially with the rakyat,” National Union of Flight Attendants Malaysia president Ismail Nasaruddin said in a statement today. Ismail said Nurulhidayah’s behaviour online reflected on her upbringing, and showed that her father is not people-friendly. “As a woman, she should have considered the dignity of the stewardesses and fought for their rights as female workers, not condemn them,” he said. 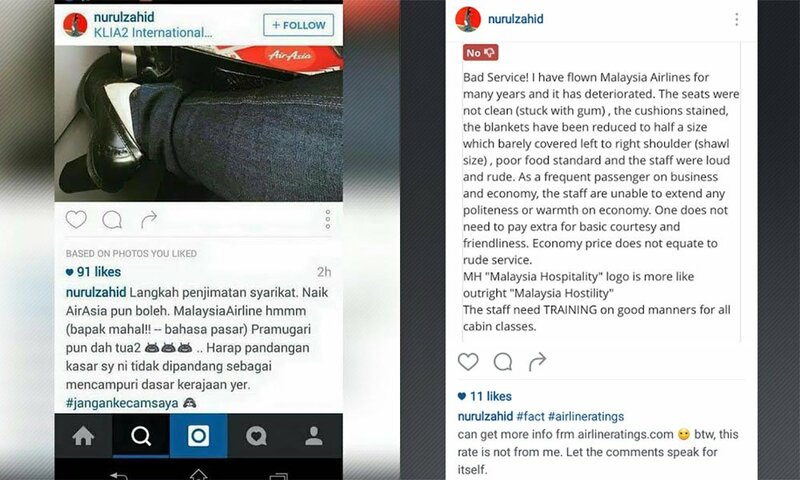 In her posting, Nurulhidayah said her company is going through budget cuts so she has to fly with budget airline AirAsia instead. She is head of Corporate Communications at Syarikat Perumahan Negara Bhd. “Malaysia Airlines is super expensive and the stewardesses are mostly old. I hope my harsh views would not be seen as trying to intervene in government policy,” she quipped. She also used the hashtag #jangankecamsaya (don’t condemn me) and laughing emoji. DPM’s daughter makes a joke on Instagram about how MAS stewardesses are mostly old. Union up in arms. It may seem petty but hear them out. This entry was posted in Uncategorized and tagged DPM, DPM's daughter, MAS, MAS flight attendants, MAS stewardesses, Nurulhidayah daughter of Zahid. Bookmark the permalink.